It's easy to think the grass is greener on the other side of the fence, but seriously. 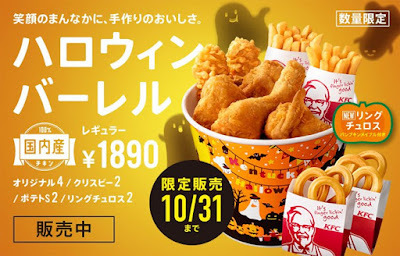 KFC does so much fun things in other countries, while here the special offerings are a different type of spicy chicken. Yay, spicy in a different way from the other spicy option. That Halloween KFC bucket offers churro rings with pumpkin maple dipping syrup. Also the bucket is decorated. The grass is ssssoooooooo much greener sometimes.